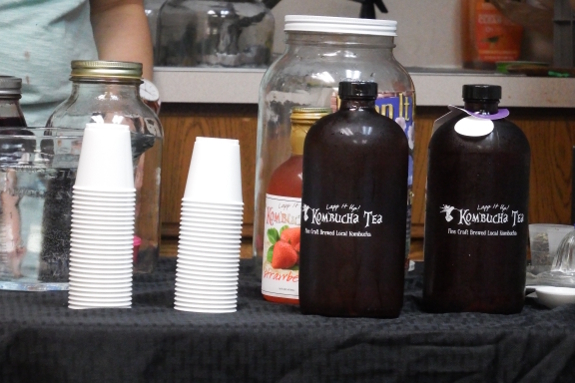 Mark and I enjoyed a class on kombucha (fermented sweet tea) and kvas (fermented, salted beets) on Tuesday. I'm not going to try to sum up every little detail because the internet is full of how-to posts. Instead, I'll just hit the highlights here. I'll start with kvas, the much less well-known beverage. 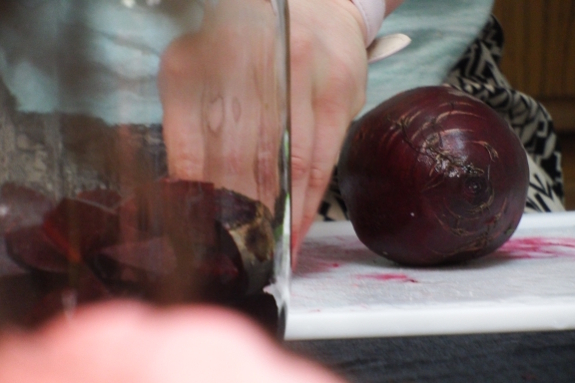 Our instructors washed and cubed raw, unpeeled beets and filled a glass gallon jar about halfway with the vegetables. One tablespoon of non-iodized salt plus a quart or two of unchlorinated water finished the preparation. After that, they let the crock ferment at room temperature for two to five days then sit in the fridge for another week to intensify the flavor. Kvas is meant to be drunk in small doses to cleanse the liver. The result is something for which I've not yet acquired the taste (although I don't really like beets or salt, so take that with a grain of, well, salt). Actually, the more interesting point came from my seat mate, who told me she made a sweetened beet pie seasoned with lemon zest last year --- now that might be worth a try. Oh you took the class with Junita from Lapp it up I see. Junita is very knowledgeable about her craft. I love her kombucha but haven't tried kvas. I wanted to take the class but since it was on a weekday it just didn't work for me. From Wikipedia: "Kombucha is produced by fermenting tea using a "symbiotic culture of bacteria and yeast" (SCOBY). Actual contributing microbial populations in SCOBY cultures vary, but the yeast component generally includes Saccharomyces and other species; and, the bacterial component almost always includes Gluconacetobacter xylinus to oxidize yeast-produced alcohols to acetic and other acids." What you are drinking is YEAST. Yuck. Again, from Wikipedia: "There are rare documented cases of serious adverse effects, including fatalities, related to kombucha drinking, possibly arising from contamination during home preparation. Since the mostly unclear benefits of kombucha drinking do not outweigh the known risks, it is not recommended for therapeutic use. Kombucha tea made with less sugar may be unappealing." Kvas, on the other hand, is a traditional Slavic drink that is also used in making traditional authentic borsch. I never did aquire a taste for kvass straight, but really enjoyed it as the acidic element in salad dressing. Then I hope you don't like beer, cider, wine, bread, grape juice or ripe fruit. While I must admit that I don't much care for yeast extract (marmite/vegemite), there are some very tasty unfiltered beers (e.g. Weizen, Hoegaarden Wit and other wheat beers). Probably the most common problem with home fermentation (and biochemistry in general) is hygiene. When you're brewing beer and you have a bacterial contamination in your brew, it generally is pretty obvious from what I've heard from brewers. But with proper cleaning and adding yeast it generally works well. Natural fermentation (without adding yeast) can be hit and miss, depending on which organism colonizes your brew first. Drinking kvas as itself is only for really tough guys, even here in Poland we prefer to have it in a soup. Barschtch is super tasty and healthy!